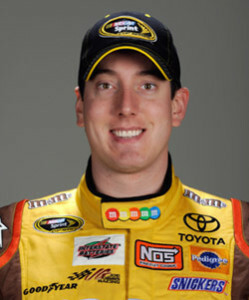 Kyle Busch is the younger brother to NASCAR driver Kurt Busch. He made his NASCAR debut in 2001, capturing a pair of top-10 finishes in six starts – at the age of 17. Kyle was prohibited from returning to NASCAR after it was announced that drivers, crew members and other participants in the Busch series, Truck series and all NASCAR Touring series must be age 18 or older to compete. In 2003, Kyle signed on with a team, but surprisingly the it was not with Roush Racing, with his brother Kurt, but rather Hendrick Motorsports. The decision paid off, and he finished second in his Busch Series debut at Lowe’s Motor Speedway.